Summary: This walk is delightful throughout. The hard work is soon accomplished on the walk onto the fells as soon as Settle is left behind and then after gasping for breath the rest of the day is a joy to behold. 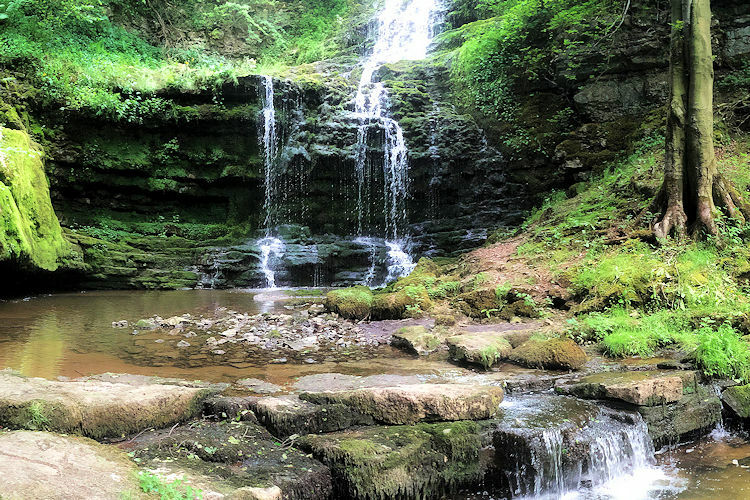 There are treats galore in store for lovers of natural beauty with Catrigg Force waterfall being the first jewel to appreciate on this treasure trove outing. 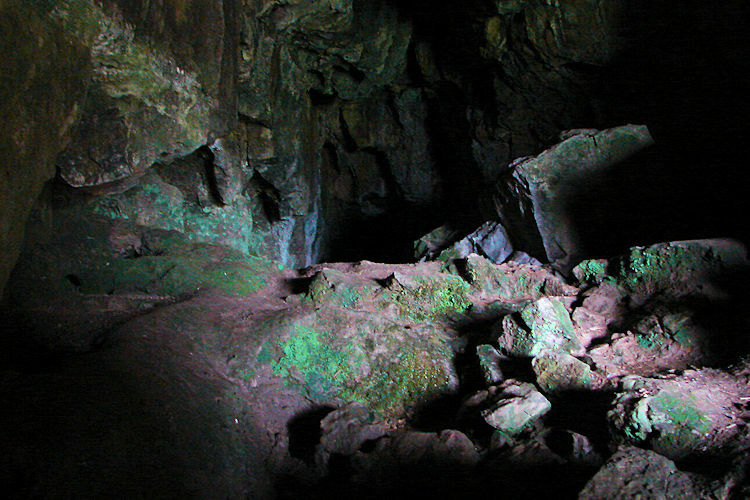 After Catrigg Force there are many opportunities to visit caves including Jubilee Cave, Victoria Cave and Attermire Cave. Then to cap off the walk there is a final delight in store at Scaleber Force waterfall before walking back to Settle via Sugar Loaf Hill . One word of advice. Don't forget to take your camera on this walk. You will certainly regret leaving it behind. Serena had not been walking for a while. Uncomfortable about walking alone and not getting lost she was seeking a little bit of confidence in map reading and compass skills. Her wish was to learn the basics. I was pleased to accommodate her. Also, as she had not been out walking in a while I wanted to make this a walk of revelations, of spectacle, a walk to remember. 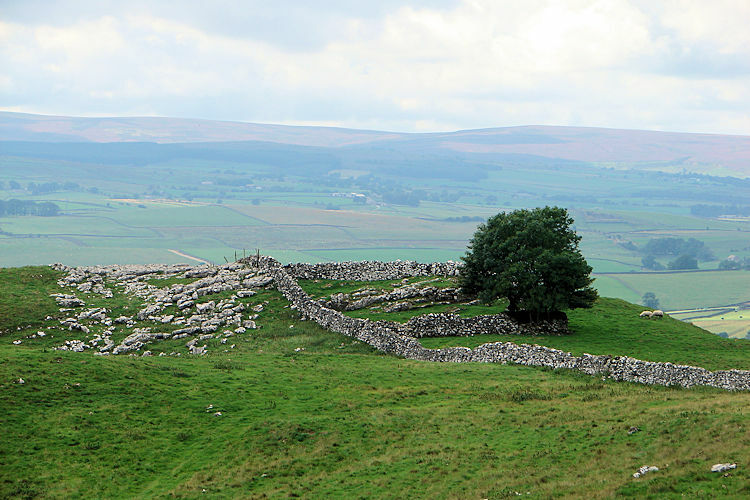 And so I chose this one which is not too long but is a good day out with a scattering of splendid geological Yorkshire Dales features at regular intervals. I chose to start in Settle for Serena came from the west and I from the east. She arrived first and early, me second and on time. We collected ourselves and were soon on our way stopping briefly at the Spar Shop and Naked Man Café in the town center to collect provisions. Serena was not going to bother as she had already prepared some but the array of selection in the café proved far too tempting. And so now we were laden up for the day and off on our way up out of town and to the fells. As we climbed the bridleway towards Attermire I posed Serena's first challenge. "Face in the direction of North?" The sun was out so I advised her to use it and once she had assumed the direction of it rising east and setting west she faced north. She also picked out a quarry in the distance and located it on the map. She had made her first steps on navigation and map reading. While on the steep climb out of town Serena told me she had been given the nickname of 'heavy breather'. I couldn't hear her at all. I was too much of a heavy breather on the climb myself to hear her! Out of shape and lacking exercise I needed this walk as much as she did. 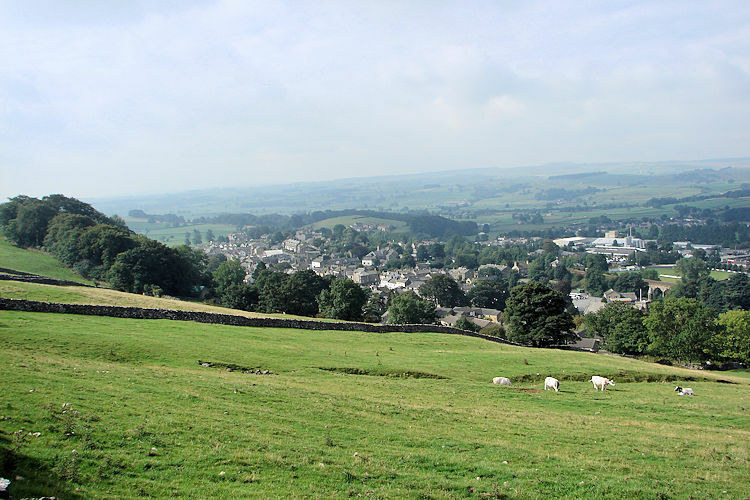 Fortunately the weather was super and the views extensive so as we climbed the views of the brilliant Dales countryside opened out for us. We both took time to stop and take in the awesome views. When I had originally mapped out this walk I planned regular wow factors. 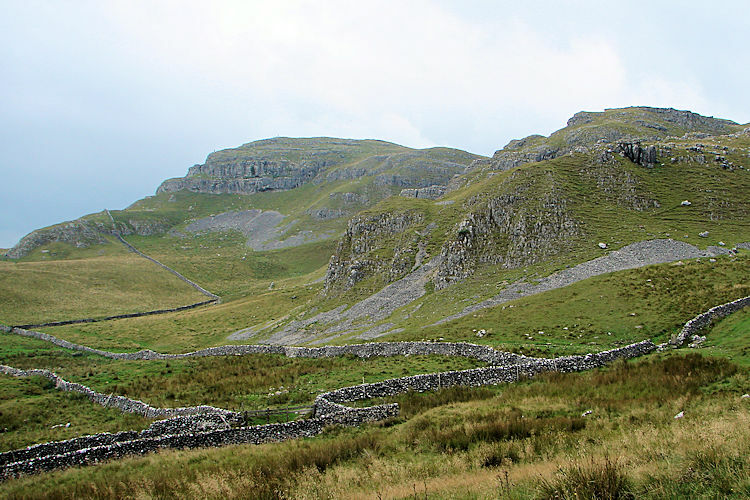 The view back towards Settle was always going to be the first one and Blua Crags and Winskill Stones which we walked past being minor wows as they were the first interesting limestone features of the walk. 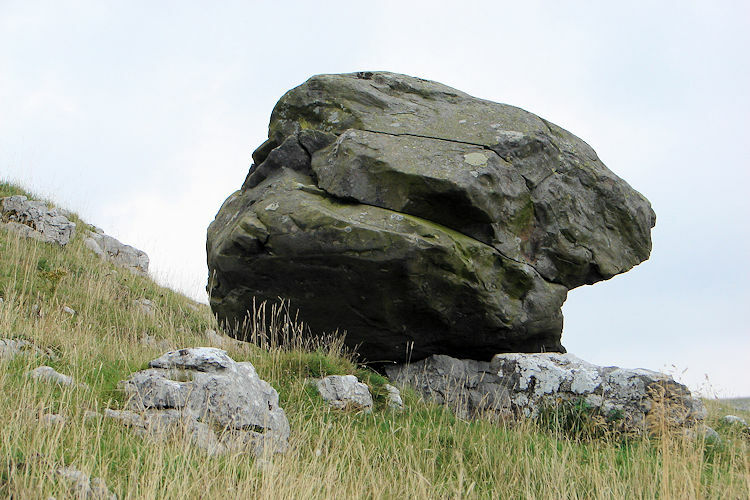 An added interest at Winskill Stones was a lonely erratic which we passed (pictured). I explained to Serena what an erratic was and how it came to be. Soon after the erratic we walked to the farmstead at Upper Winskill where a sign pointed us to Catrigg Force. We followed the direction across a field. As we walked I pointed out a becalmed beck to Serena, so serene and peaceful. I told her to take note. Once across the field we headed through a gate and down a track which led us down to a secluded copse. I told Serena we were approaching a major wow. As we neared the copse the noise became clear, a surging noise hidden in the trees. Once at the copse Serena saw the cause. She was instantly captivated as she approached the top of the waterfall. So was I. We were now at Catrigg Force, one of my favourite Dales waterfalls. Standing above the waterfall is great, standing below it is something else altogether. I led Serena down through a gate into the lower copse and down some steps. Serena was struck dumb by the calm grandeur inside the green leaf canopy. She was enthralled more as she made her way down to the dropping pool beside the sheer vertical gritstone rock face which had been hewn out over the years by Catrigg Force, or Catrigg Foss as previously called. Inside the chasm and down by the waterfall was awesome the first time I came here. I could sense it was for Serena too and I knew she had just taken in a wow. We stayed a while looking around the Catrigg cathedral for that it is, a place of awe. A damn that we had to leave. 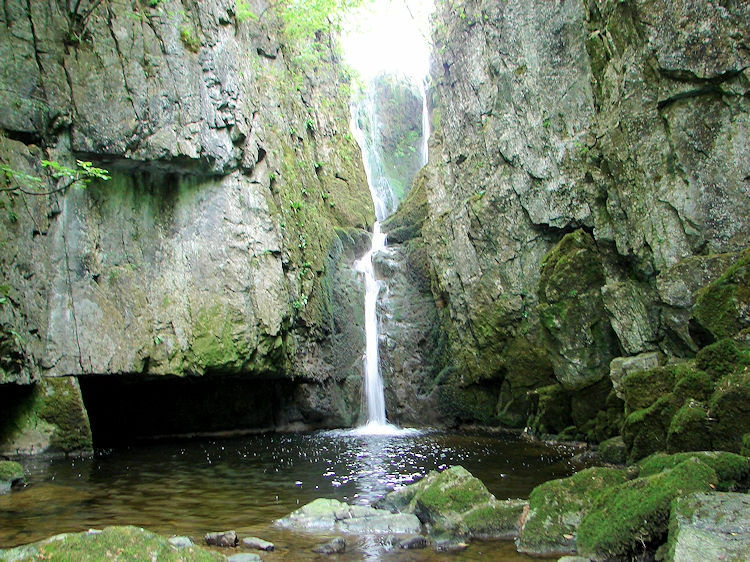 Catrigg Force captivates and encloses you in. That is clear for having climbed out and back onto the fell I felt a heightened feeling of openness. I always feel it after such breathtaking events. We had not been long back into the open when Serena commented how the mood of the open fells always entranced her. The early sun we had accompanying us was now in and the weather was deciding what to do. Rain or not? We were not sure. Nor had the BBC weatherperson being when I checked before I had left home. Oh well. From Catrigg Force we walked back across the field to Upper Winskill and a bridleway where Serena took a map bearing and correctly called south which we took past our previously encountered erratic and to a junction on the bridleway. Again Serena was tasked to choose direction and after a little guidance took the right fork and then a track back on due south across open fell which was to lead us to yet another wow. We had now reached a gritstone line where three caves were marked. These were Jubilee Cave, Victoria Cave and Attermire Cave. My choice for Serena to discover was the middle one and the biggest, Victoria Cave. Crossing the high fell to the cave from the north is best for the outstanding outline of Warrendale Knotts is in constant view. 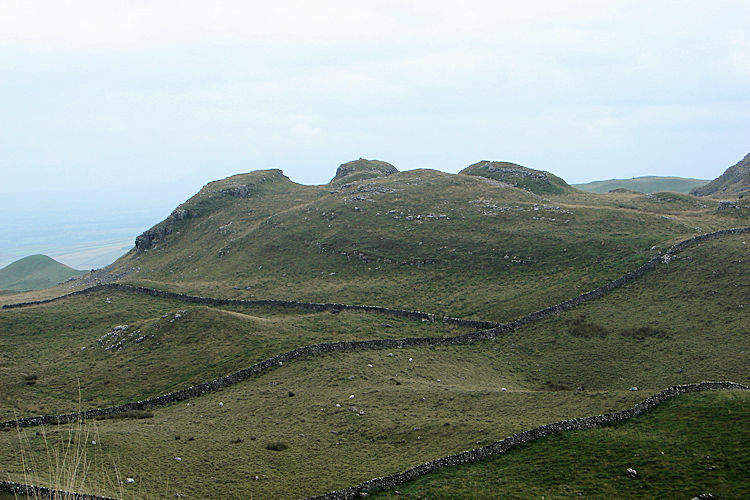 They remind me of Lakeland's Crinkle Crags and Langdale Pikes. Not in size of course but in their beautiful sculptured outline. If you see them you will know what I mean. I looked over at the Knotts always, cutting short my perceptive walking time to the foot of Victoria Cave. Thus I was soon there and I took no respite in leading Serena to her next major wow of the walk. After a short scramble up from the path we were at the cave. Serena talked about the strange beauty of the rock face inside. The luminescence further inside also took the eye. Outside an information board told us of findings in the cave including bones of rhinoceros and other exotic beasts. 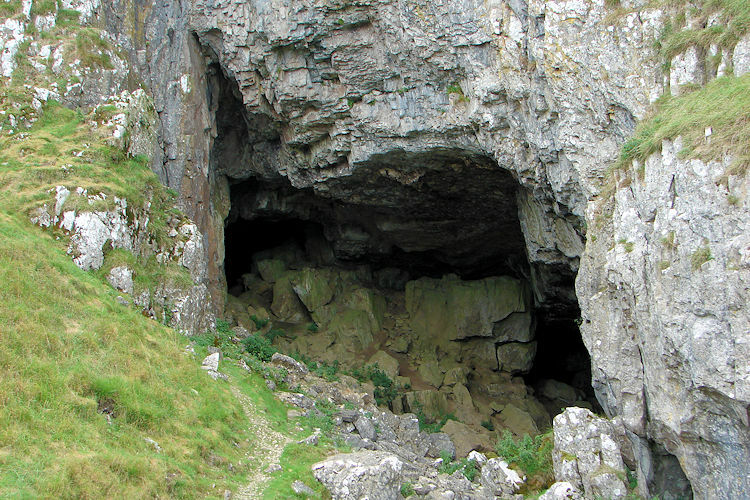 The cave has been host to many visitors over eons of time, seeking shelter, worship or contemplation. It continues to be so for all those reasons. 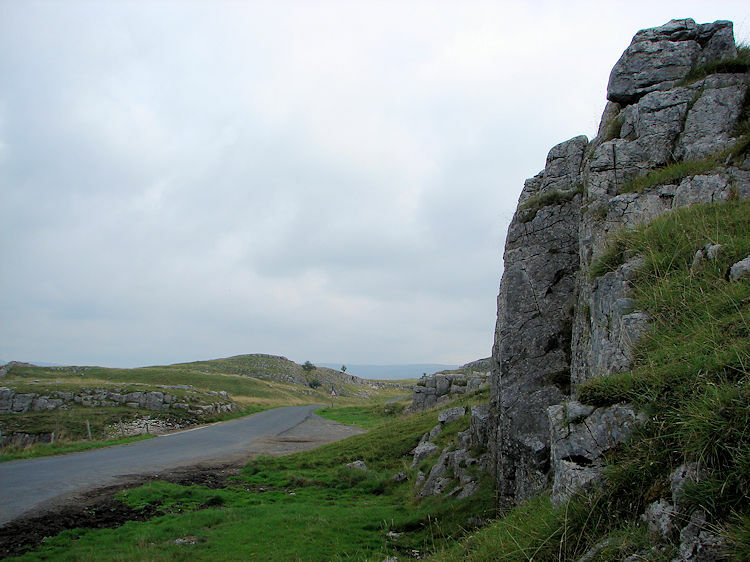 After Victoria Cave we followed our route south past Attermire Cave and to Attermire Scar. 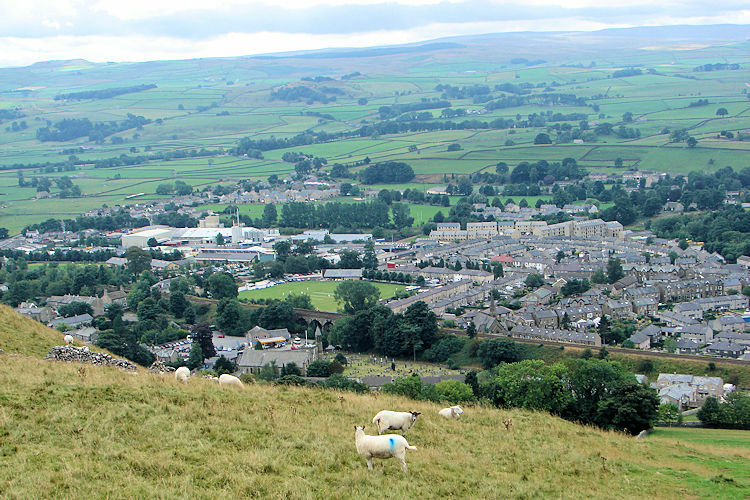 Here I pointed out the distant profile of Pendle Hill which Serena had once climbed. I told her I hadn't yet so she was one up on me there. I have got to do it. At the foot of a scree slope near the scar we found a convenient rock seat and took a well earned lunch break where Serena enjoyed her Naked Man Sandwich. 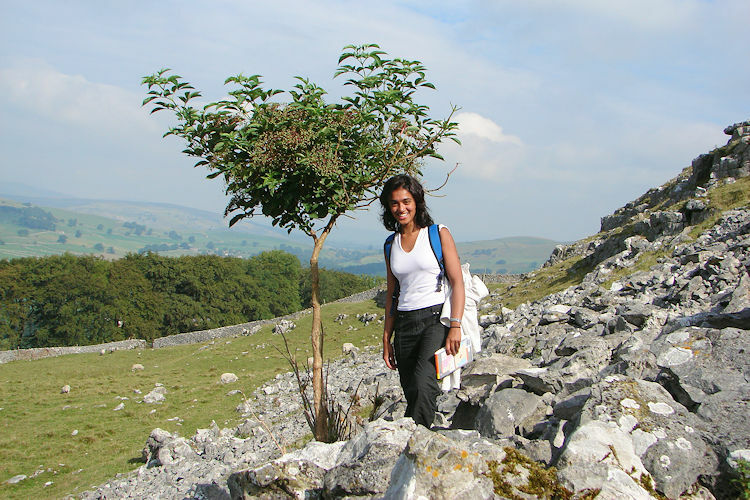 Afterwards we tracked west along Settle Scar and onto Stockdale Lane where once again Serena took the bearing for our final wow destination at Scaleber Force. The Force is another exquisite Dales waterfall nestled in a woody copse with another spectacular leaf canopy. It has to be visited although it is not quite as romantically situated as Catrigg Force. As Catrigg is remote then Scaleber is convenient for it sits by the roadside thus attracting casual visitors and passing drivers. Most are courteous but the convenient location does allow the odious few to deposit their despicable trash litter which galls me for Scaleber does not deserve such treatment. It is a special place. Luckily it was in good health when I took Serena to her wow moment there. We took a few moments to take in the goodness of the place before moving on back to our starting place in Settle.